People can be very cynical when they see former Manchester United striker Javier Hernandez praying before kick-off, or Liverpool's Daniel Sturridge pointing to the sky when he has scored, but I'd like to try to explain how faith can help with playing top-level football. I've grown up believing in God and I believe that being an England international and a lawyer has not just happened by accident. Very recently I've come to realise that it can help take the pressure off me when I am feeling very anxious and nervous, and I have a lot to thank former Portsmouth defender Linvoy Primus for in recognising that. I got to know Linvoy because his daughter, Atlanta, plays for Chelsea's development team and it was while we were discussing our faith one day that she suggested I speak to him. If you haven't heard of Linvoy, he was a no-nonsense defender who played for Portsmouth between 2000 and 2009. He wasn't always a Christian and when he decided to take that path, a lot of players at the club in the macho world of the dressing room didn't understand it. But in the end, they came round, to the extent that there were five or six players at Portsmouth who joined him in praying before games. Having spoken to Atlanta about this, I sought out Linvoy after a period where I had questioned my faith. As I have explained before, losing the Women's Super League title on the final day of last season was a horrible experience. Beforehand, I prayed a lot, I went to church and did all the things a Christian should do. Then when you don't get a result, you sometimes wonder: what is the point? I also had a difficult experience at the World Cup where I didn't play in some of the bigger games, but, looking back, I believe those experiences were meant to happen. That's easy to say now because all these things were weighing heavily on my shoulders in the build-up to the FA Cup final last month and I worked myself up into a bit of a state prior to that game. I was not myself. That is where Linvoy stepped in, allowing me to produce one of the best performances of my life at Wembley. I called him and his message was simple. He said that I couldn't control what was going to happen at Wembley, but what you can do is play for something a lot bigger. Play to glorify what you believe in, play to glorify the positive impact that God has had on your life. It might sound difficult to understand but it released the pressure. It meant that all of a sudden it wasn't about me; it was about everything I believed in: my family, God, all the things that make me who I am. I was putting everything in God's hands. Lo and behold it worked and, relieved of the pressure, I enjoyed it so much I ended up being named player of the match. It might sound weird to some people but it certainly helped me at a time when I really needed it. I wouldn't call myself a religious person. For me, there is a huge difference between religion and faith. Religion, to me, is all about the person. It's like they're saying, 'look at me, I pray five times a day, I go to church every week and I'm a great person'. I'm not sure that's the case. I've met some terrible people who are Christians. I'm more of a person who has a relationship with God, and it's a very active one. So whether I'm having my breakfast, driving, standing on the pitch or about to take a penalty, I will be praying or in my mind speaking to God. I don't have a set routine; I just pray when the time is right and it can be for all manner of things, including being in the England squad. But I tend to pray to perform well, which would hopefully lead to that. I did that on the pitch before the FA Cup final. I had already listened to several pastors and some uplifting gospel music en route to Wembley but prior to the match, I just stood on the pitch and said to myself, 'God, I want to play to your glory. Give me the tools to help me play well and help my team win.' It's just like having a conversation with another person. I've prayed with Atlanta before but it's not something I impose on other people. When I used to play in the United States for St Louis there were a lot of Christians in the team, so we prayed together before and after games. We were a very close-knit team and when you can share your faith it can be quite powerful. My mum is a strong Christian but I'm fortunate that she never forced it on me. Watching what happened with her life inspired me. I don't go to church as much as I used to because we often play on Sundays, but I read the Bible and am inspired by the music and pastors that I listen to. My belief has been reinforced by seeing many things where I just believe God is having an impact. I don't believe the success I've had is just down to me. Getting a first-class degree is one example. I'm an intelligent person but I had to work incredibly hard to understand some of the subjects I was learning about. Never in my wildest dreams did I believe I would get a first. I just think there was a certain amount of fortune that came on me in terms of my dissertation, the tutors who helped me and for me that is not just a coincidence. There have also been coaches who doubted me in the past. I had one during a previous spell in my career who was basically a bully. They spoke very badly about me to the players, but then I had an opportunity to become one of the best players in America. You could say that proving doubters wrong is something that happens a lot in life. Some call it fate; others call it karma; I call it God. It can't just be me pulling the strings. 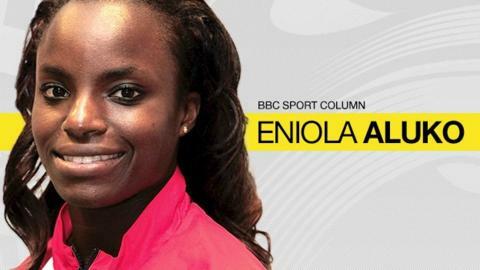 England and Chelsea forward Eniola Aluko was speaking to BBC Sport's Alistair Magowan.